On a rain-washed evening in Kilinochchi about three weeks ago, Saraswathi Ramasamy related a story, her words tumbling out in a rush as her expert hands deftly sliced a green mango plucked from a tree in the garden. She hands a piece to each visitor, speaking earnestly, quietly all the while. The day had been long and the unfolding twilight was distracting in the wild and sprawling property her family owns in the tiny village of Ambalpuram. It took a few minutes before the gravity of Saraswathi’s story began to sink in. She spoke of a family trapped in a shrinking battlefield, over several months pushed and pushed to the very edges of the Wanni. They had tried to stay together and find a way to escape the fighting by crossing into ‘cleared areas’ the war-time term for territory held by Government forces. As they ran, the family had to keep taking cover from the shells raining down on the area from far-off artillery positions. One day, the family was on the run again when the shells started falling. For Saraswathi’s youngest daughter, only 12 at the time, death came instantaneously, her mother says. Alongside the child, lay four other members of the Ramasamy’s extended family, Saraswathi’s brother-in-law, his wife and two children – all killed by the single wayward shell. “There was nothing we could do. We had to keep running. We dug a hole and buried all five inside. Then we had to go,” she explains. Throughout Saraswathi’s tale, she never once apportions blame. There is only weary resignation. And tremendous, still-lingering, pain. The tale was chillingly familiar, mirrored in multiple UN documents and media reports. But it was the fact that we had just stumbled upon her randomly and the nature of her retelling that was so haunting. But it wasn’t random. In Kilinochchi, the heart of the Tigers’ de facto administration for so many years, nearly every resident will tell similar stories; speak of similar terror, of similar loss. Seven years later, even in this district at the heart of the conflict between the LTTE and the Sri Lankan Government, much of the time the war seems so far away. New roads, buildings sparkling in the sun and ambitious livelihood programmes are altering the landscape in the most battle-worn towns. But Saraswathi’s story of how her family had been touched by those much-written about final battles a few miles from where we were sitting, watching the darkness fall, brought the legacy of the conflict back with disturbing suddenness. The Ramasamy family embodies the determination and resilience of a community intent on moving forward – a new house to replace the shell-shattered one still standing in the compound, a tractor to rent out in ploughing season and a fresh-faced young girl whose job at an apparel factory is altering her family’s fortunes. Saraswathi beams with pride about her daughter’s success that we have visited to chronicle. But the pain of loss is never far away either. As her daughter speaks cheerfully during an interview of her future plans – to find a husband, to build another house for themselves in the same property – Saraswathi wrings her hands and whispers the rest of her tale to anyone willing to listen. Her eyes full of a million unshed tears, she speaks again about the little daughter she buried on that blood-soaked strip of beach deep inside the Mullaitivu District. Survivors like Saraswathi, people who have suffered untold pain and loss, must frame the current debate on transitional justice. To what extent the Government, legal drafters and reconciliation agencies understand that behind the academic debate lies the suffering of real people, and how far the Government can convince people on both sides of the ethnic divide to acknowledge each other’s pain, will ultimately determine the success or failure of its search for truth and justice. Seven years to the month after the war ended, the Government announced its intent to establish the first ‘pillar’ of a four-pillar transitional justice mechanism it committed to at the UN Human Rights Council in Geneva last September. 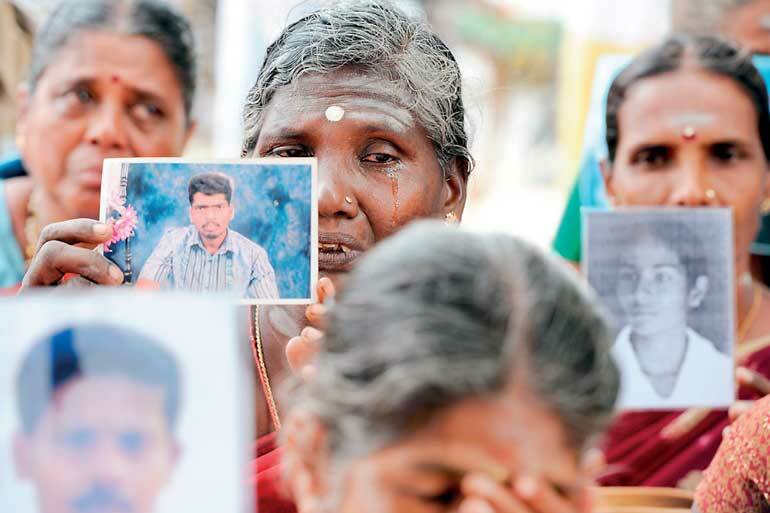 Draft legislation to set up a Permanent Office of Missing People (OMP) was presented to Cabinet by Prime Minister Ranil Wickremesinghe last week, eight months after the pledge in Geneva. Concerns have been raised by civil society and human rights groups about the failure to consult victim families before the mechanism was designed. But over a relatively short period of consultations with disappearances activists, civil society and other stakeholders, including the Tamil National Alliance, the Government has managed to draft legislation to deal with an acute problem that even activists grudgingly admit addresses major areas of concern with regard to disappearances. The legislation empowers the Office, comprising 14 commissioners appointed by the Constitutional Council to investigate and trace missing people and relay information to victim families. A controversial clause under discussion during the consultations was a proposed ‘firewall’ between the OMP and other transitional justice structures the Government is proposing – specifically the prevention of testimony provided to the OMP being shared with a future prosecutor or investigator on the Special Court that was also proposed as part of the four pillar system to prosecute perpetrators of war-time atrocities. This provision was subsequently excluded, even while the OMP will have no power to prosecute. The OMP Bill was approved by the Cabinet of Ministers and has just been gazetted. It is likely to be tabled in Parliament during the UNHRC June Session which begins in two weeks. Interestingly, the remit of the OMP includes an open timeframe, allowing the Commissioners to hear testimony and trace disappearances which occurred outside and beyond the civil war. If it becomes a credible, working mechanism, the OMP could potentially help families who have been searching for loved ones since the JVP insurrections of 1971 and the 1980s to finally get some answers. For the Government, the OMP is what it likes to refer to as ‘low-hanging fruit’. That is, the parts of the transitional justice structure that can be established quickly are widely acknowledged by all parties as crucial to national healing and will result in the least political stumbling blocks. But while the OMP is largely uncontroversial, it’s also a crucial place to start the justice-seeking process. In Sri Lanka and countless other countries in transition from conflict or authoritarianism, transitional justice processes have been driven by disappearances activists. The most powerful of these is the Madres de Plaza de Mayo in Argentina, where some 30,000 people were disappeared between 1976 and 1983 by a series of military juntas. Powerful and unrelenting agitation by disappearances activists in Argentina paved the way for criminal charges to be filed against 800 accused, with 200 sentenced following trials in domestic courts. Last week, an Argentine court convicted 18 former military officers – including Argentina’s last dictator Reynaldo Bignone, 88 – on charges including kidnapping, torture and forced disappearances during a brutal multi-nation operation to eliminate left-wing activists across South America. Families of the disappeared are patently visible victims and become powerful symbols in campaigns to end impunity. This holds true for Sri Lanka, where thousands of families searching for loved ones missing since the war have become the faces of the clamour for justice and accountability for crimes committed in the final months of the war; while victims of indiscriminate shelling, for instance, have remained mostly invisible. As has become apparent during the LLRC and Paranagama Commission processes, the testimony of these families will continue to point to major rights violations and potential violations of international humanitarian law that governs conflict situations. There is, in fact, no better place to start the truth-seeking process. Ahead of the June session of the Human Rights Council, the Government will also try to begin the process to reform the Prevention of Terrorism Act (PTA) with a new bill that seeks to bring the country’s anti-terror laws within the framework of international law and best practice. Agitation for reform of the draconian PTA has been long-standing and forms an important aspect of the Government’s international human rights commitments. Ahead of the UNHRC session in March 2017, when a full report on the Sri Lankan Government’s implementation of the resolution it co-sponsored in September 2015 comes due, the Government will try to complete the next least controversial step in its four-pillar proposal for transitional justice: the truth and reconciliation commission. By this time, the Government also hopes the constitution-making process will also be well underway, with power-sharing proposals for the Tamil-dominated Northern and Eastern Provinces on the table that will help to demonstrate its commitment to preventing a recurrence of ethnic strife. It is also hopeful that perceptions about justice seeking will change within the country by this time, as the reconciliation drive gains momentum and nationalist hysteria whipped up by the former administration dies down. To this end, the Government will take its time over the establishment of the special court to try alleged war crimes. In the same week that the Government unveiled the OMP, it also doubled down on its insistence about the exclusion of foreign judges from the special court. Senior Ministers speaking on condition of anonymity told Daily FT that the Government had decided foreign judges were “off the table,” but that they were also hoping international participation in the special court could be accommodated in other ways, such as the inclusion of foreign investigators, experts and forensic analysts in the prosecutorial process. There are other complications with regard to the establishment of the court, even one that comprises only local jurists. For one thing, Sri Lanka currently has no laws to prosecute violations of international humanitarian law – war crimes and crimes against humanity. These are not crimes, legal analysts say, that can or should be tried under the category of ‘murder’ or ‘abduction’ because of the systemic nature and enormity of the crimes. A prerequisite for prosecutions in the proposed special court therefore would be the enactment of retroactive legislation, or ex post facto law. Sri Lanka already has precedent for introducing statutes in this way, specifically during the Sepala Ekanayake hijacking case in 1982. Ekanayake hijacked and diverted an Alitalia aircraft in order to be reunited with his Italian wife and their son and demand a $ 300,000 ransom from the Italian Government. Rather than submit to Italy’s demand for Ekanayake’s extradition after his return to Sri Lanka, the Government introduced retroactive legislation to prosecute the hijacker domestically. By 1982, Sri Lanka had ratified all three major international conventions on air piracy but had failed to pass enabling legislation to make Ekanayake’s actions criminal in the country. Three weeks after the hijacking, the Sri Lankan Parliament passed the Offences Against Aircraft Act of 1982, which was importantly, decreed to be law retroactively from 1978, making Ekanayake’s crime retroactively illegal under Sri Lankan law. Under the 1978 Constitution, ex post facto criminal law can only be enacted if the law is based on general principles of international law. In the case of the proposed Special Court, the enactment of ex post facto law will be possible since International Humanitarian Law (IHL) now falls within the ambit of customary international law as accepted by UN member states. The larger problem, from the Government’s perspective, will be getting this law through Parliament with a Mahinda Rajapaksa-led Joint Opposition likely to oppose tooth and nail any mechanism to try soldiers for crimes committed during the war or apportion blame for alleged atrocities on a command structure which at the time included key members of the Rajapaksa family. The Special Court will remain the Government’s last priority, therefore, until it is confident it can carry the southern constituency along in the accountability process and prevent a political backlash from the nationalist fringe. The danger, civil society activists say, is that prolonging the implementation of the promised structures will destroy momentum and delay justice for victims – perhaps indefinitely if the current administration is unseated or the political will for delivering transitional justice proves fleeting. So far, the Government is yet to take meaningful steps to change attitudes in the south with regard to the accountability process. It is certainly not sowing mistrust between communities about this process, but it has also failed to take an offensive path and really ‘own’ its truth and reconciliation initiatives. Foreign Minister Mangala Samaraweera is an exception to this rule. Samaraweera is confident that the southern constituency has the capacity for compassion, if and when the truth about what happened during the final months of the war is finally revealed. Minister Samaraweera believes that the people of south have been influenced by a six-year propaganda operation executed by the Rajapaksa administration, to believe that justice for atrocities committed in war time was tantamount to a betrayal of the security forces and a repudiation of the ‘righteousness’ of the war against the LTTE. The Foreign Minister, who has the heart of an activist still after a year in Government, speaks openly about how he showed several members of his Matara constituency the Channel 4 footage from the final weeks of the war, which laid bare unspeakable atrocities in the battlefields of the Wanni. At the end of it, Samaraweera says, grown men watching the footage had been in tears. “The Sinhalese people are a pretty compassionate bunch,” he says. Samaraweera’s assertions may not necessarily be wrong. Observers of the LLRC process speak of how they watched the personal transformations of the Commissioners on the Rajapaksa appointed panel as the proceedings progressed. Victim testimony is a powerful force. The faces and voices behind the technical narrative of events that unfolded during the final days of the war humanise the truth-seeking process and give it life and meaning. Perhaps that explains why the LLRC report, against all odds, became a largely-credible document that has been used ever since by the international community as a blueprint for reconciliation in Sri Lanka. A credible Truth and Reconciliation Commission, with public sittings that are broadcast live across the country, could be the best case the Government could ever make for the establishment of a special court to try major cases of rights violations during the war. For that reason, the Government’s plan to begin with the least controversial aspects as it sets up the Transitional Justice structure could still work. In the grand picture of justice and accountability in Sri Lanka, Saraswathi Ramasamy is one of the invisible victims. During the war, even while living in the Tiger stronghold, the Ramasamy family stayed out of the fight, hiding their children during LTTE recruitment drives and staying out of trouble and under the radar. Post-conflict, she is neither activist nor agitator. She and her family have chosen to move on; to rebuild. But victims like her must be seen. They must be acknowledged. From the battlefields of Mullivaikal to the mass burial site recently uncovered in Matale, there are countless victims and tragic stories behind the push for justice and accountability. The ongoing process of reconciliation and transitional justice is far from perfect. It is not fast enough, it is not consultative enough, and it is fraught with political danger for a Government that is still finding its feet. But in spite of the imperfections, this process, combined with the promise of a new Constitution to guarantee the rights of all Sri Lankans and a Government that is still displaying a degree of political will, could be the country’s last best hope to bring about a sustainable, lasting peace. True peace will elude Sri Lanka until the north and the south can find a way to acknowledge each other’s pain and loss, the murder and exploitation of fellow citizens and resolve that it must never happen again. The struggle for transitional justice is not an abstract; it involves real victims, real crimes and a real clamour for justice that must be grappled with, to end the cyclical violence and bloodletting that has marked every decade since independence. For too long, truth and justice seeking for crimes committed in war-time has been viewed as an international prescription upon a smaller, weaker state. It is not a ‘Geneva issue’ or a ‘foreign policy debacle’. Respect for human rights is at the heart of the re-democratisation project that began on 8 January 2015; and the truth is that the search for answers and answerability is a battle to regain Sri Lanka’s soul.